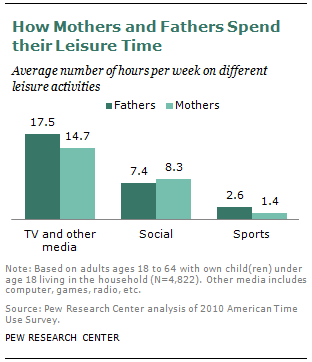 In America, fathers, on average, have about three hours more leisure time per week than mothers. This “leisure gap” has been consistent at least over the past decade. What are dads doing with their extra time? For the most part, they’re watching TV, according to new Pew Research Center analysis of data from the government-sponsored American Time Use Survey (ATUS). There is a large body of research devoted to studying leisure time. Some studies like those of time-use experts John P. Robinson and Geoffrey Godbey, use a broader measure of “free time,” which is the time left over after subtracting all hours spent in paid work, housework, childcare, and personal care. Other studies, such as one by Mark Aguiar and Erik Hurst in 2007, focus more narrowly on the time explicitly devoted to recreational activities or relaxation. Using the narrower definition of leisure, our analysis of the 2010 ATUS data finds that fathers with children under age 18 in the household on average spend about three hours more leisure time than mothers (27.5 hours per week vs. 24.5 hours per week). Most of the gap is found in front of the television set. Fathers spend 2.8 hours more each week than mothers watching TV or using other media. Fathers also spend more time playing sports or exercising than do mothers, while mothers spend more of their leisure time in social activities such as attending or hosting parties. While there are gender differences in these different types of leisure activities, TV watching is a primary leisure activity for both parents. Fathers spend about 64% of their leisure time watching TV or using other media. For mothers, the share is 60%. The ATUS not only asks people how they spend their time but also how they feel while they’re engaged in particular activities. 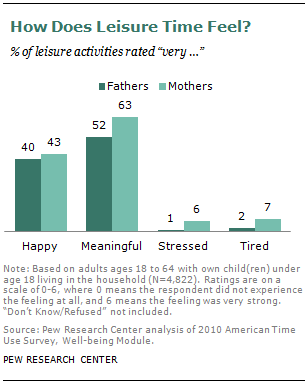 Our analysis of this data shows that mothers find their leisure time to be more meaningful than do fathers. Mothers rate 63% of their leisure activities “very meaningful,” while fathers give a similar rating to about 52% of their leisure activities. Meanwhile, mothers feel more exhausted than fathers during their leisure time, and their stress level associated with leisure time is higher as well. The fact that mothers feel more stressed and tired than fathers even during their leisure may have to do with the way they experience their time. Mothers’ free time is often interrupted, which may make it hard for them to relax, according to a study by sociologist Suzanne Bianchi and others. Moreover, a study by Shira Offer and Barbara Schneider found that mothers tend to spend more time than fathers in multitasking, and the additional hours spent on multitasking are mainly related to time spent on housework and child care. For more information on how the time use data is collected and the classification of leisure activities, see our report on modern parenthood and parents’ feelings about their time. Wendy Wang is a former senior researcher focusing on social and demographic trends at Pew Research Center.